The London Eye is a giant Ferris wheel which is a modern and a very popular tourist attraction. This amazing structure adjoins the western end of Jubilee Gardens which was previously the site of the former Dome of Discovery, on the South Bank of the River Thames between Westminister Bridge and Hungerford Bridge, in the London Borough of Lambeth. It is a giant observation wheel that is 135 metres tall structure built as a part of London’s millennium celebrations. 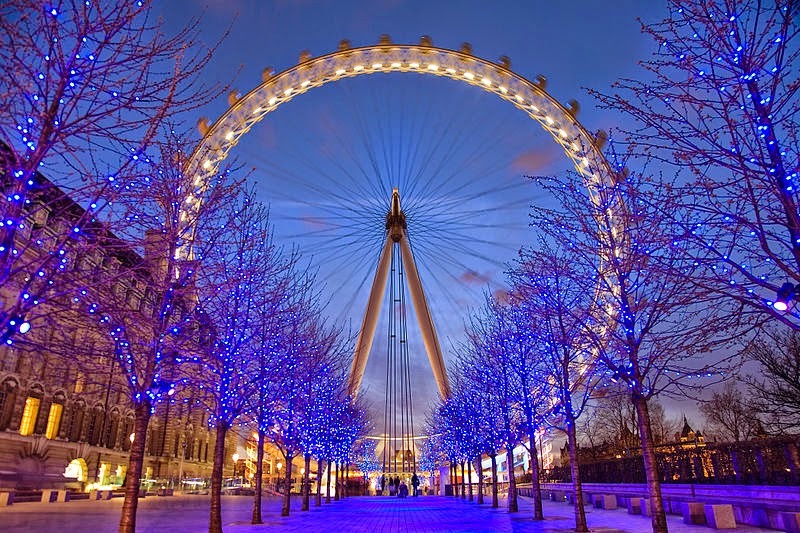 Known as the Millennium Wheel, the official name was originally the British Airways London Eye, then the Merlin Entertainments London Eye between January 2011 and August 2014, the EDF Energy London Eye and is presently known as the London Eye. Towards late January 2015, the London Eye would be sponsored by Coca Cola. The overall structure has a diameter of 120 metres and when it was erected in the year 1999, it was one of the world’s tallest Ferris wheel with its height surpassing by the 160 m of Star of Nanchang in 2006, 165 m of Singapore Flyer in 2008 and 167.6 m of High Roller – Las Vegas in 2014. It has been supported by an `A’ frame only on one side unlike the taller Nanchang and the Singapore wheels and the Eye has been described as `the world’s tallest cantilevered observation wheel’, by its operators.Presently it is Europe’s tallest Ferris wheel offering the highest public viewing point in London, till it was superseded by the observation deck by the 245 metre on the 72nd floor of `The Shard’ that opened on 1st February 2013 to the public. It is one of the most popular paid tourist attractions with over 3.5 million visitors annually in the United Kingdom with several appearances in popular culture. Architects like Frank Anatole, Nic Bailey, Steve Chilton, Malcolm Cook, and Mark Sparrowhawk together with the husband and wife team of David Marks and Julia Barfield had designed the London Eye. It was Mare who was responsible for the construction management while Hollandia was the main steel work contractor with Tilbury Douglas as the civil contractor. Tony Gee & Partners, Consulting engineers, designed the foundation works and Beckett Rankine designed the marine works. Nathaniel Lichfield and Partners helped in The Tussauds Group in obtaining planning as well as the listed building consent in altering the wall on the South Bank of the Thames and also examined and reported the implication of a particular Section 106 agreement which was attached to the original contract. Thereafter they also planned and listed building consent application for permanent retention of the London Eye which also involved the co-ordination of an Environmental Statement together with the production of a planning supporting statement with details for the reason of its retention. Tensioned steel cables support the rim of the Eye resembling a huge spoked bicycle wheel with eighty spokes connecting the rim with the spindle. Lighting was redone by Color Kinetics with LED lightning in December 2006 to enable digital control of the lights, opposed to the manual replacement of gels over fluorescent tubes. The wheels which were constructed in sections were floated up the Thames on barges and then assembled lying flat on piled platforms in the river and once the wheel was finalised, it was lifted into an upright position by a strand jack system made by Enerpac. At first it was raised at 2 degrees per hour till it had reached a 65 degree and then left in that position for a week with engineers preparing for the second phase of installing the structure. It was a European project with major components from six countries, where the steel came from the UK and fabricated in The Netherlands by the Dutch company, Hollandia. The cables were from Italy while the bearings were from Germany – FAG/Schaeffler Group, the spindle and hub was cast in the Czech Republic. The electrical components came from the UK and the capsules were made by Poma in France and the glass for all these came from Italy.The construction of the observation wheel took over a year and a half for completion for which over 1700 tonnes of steel were used for the structure with more than 3000 tonnes of concrete used for the foundations. The capsule accommodating around twenty five people were transported all the way from France by train through the Chunnel with each egg shaped capsule being eight metres long weighing five hundred kilograms. Its twenty five meter long spindle has been built in Czech Republic and its rim diameter around two hundred times the size of a bicycle wheel. The observation wheel tends to turn slow enough for the passengers to embark while it moves where a complete turn takes around thirty minutes. 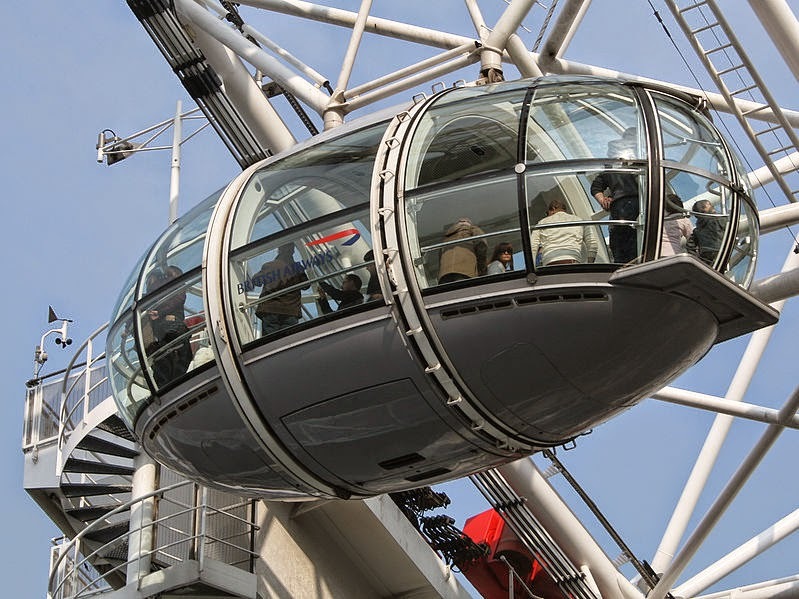 With its amazing construction of the glass capsules on the outer side of the rim, passenger can have an awesome view of 360 degrees over London.